As a celebration to end our study on the Romans, we had our amazing Roman Brunch. We would like to say thanks to the parents for supporting the event. The students loved every moment of it. 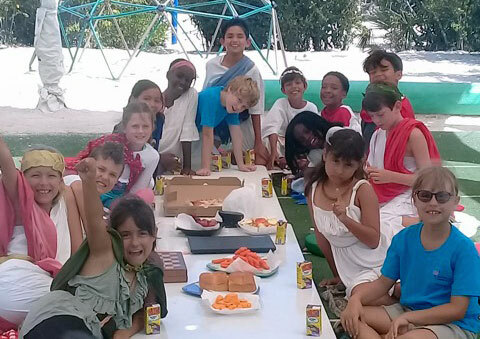 They came all dressed up in their Roman outfits and were able to experience what life was like for the Romans when they feasted. We had roman music playing in the background as we enjoyed a meal of grapes, apples, pizzas, cheese and so much more. Time was also spent getting familiar with the Roman Numerals and using them on their hand-made clocks as well as challenging themselves with Maths problems written using Roman Numerals. Each child was also given the opportunity to share some very cool facts about a famous person from that era. We learned a wealth of information about Boudicca, the Queen of the Iceni tribe, Emperor Nero, Octavia, Gaius Marius and Spartacus who was a famous Gladiator. The Year 4 Flamingos have spent the past few weeks discussing interesting facts about the Romans. We’ve discussed the use of arches and columns in Roman architecture and why they used aqueducts. Although they did not invent the arch, the Romans were the first people to build arches into big buildings and aqueducts. An aqueduct was built to carry water. It was like a bridge, built on arches. On top was a stone channel to carry water. The Romans used aqueducts to supply towns with water from springs, rivers or lakes. The Romans were also very innovative and creative in their engineering of roads, some of which are still around today. The Romans have left a legacy that has impacted our lives in so many ways. The civilization of Ancient Rome had a lasting legacy on world history. Not only did Ancient Rome cover a vast amount of land at its peak, but it also existed for almost 1000 years. The legacy of Ancient Rome is still felt today in western culture in areas such as government, law, language, architecture, art, food, engineering, and religion. Also see some previous class’ Roman blog posts. What a lot of learning!